A quick search online for “NYC Museums” is overwhelming—if you need a clearer sign as to why the city is such a hub for tourism, just start with this list. New York is home to some of the largest art museums in the country, but also boasts hundreds of small galleries and cultural centers that really captivate and celebrate the diversity that is New York City. But with an estimated 50 million plus tourists passing through the city each year, the details that go into each exhibit might get overlooked. When I say ‘overlooked,’ what I mean is that the majority of attendees to these museums are more concerned with seeing a specific exhibit or piece (example, the Metropolitan Museum of Art draws record numbers to its Temple of Dendur in its Egyptian wing, or the Museum of Modern Art for Van Gogh’s ‘Starry Night’) versus giving attention to the detail that went into creating that exhibit. And for many of these exhibits, AV plays an integral part in creating the experience the curator imagined. Recently, I met with Museum of Modern Art curator Juliet Kinchin to talk about her new exhibit ‘Making Music Modern: Design for Ear and Eye,’ a show that tells the story of music, design and technology, starting from Edison’s invention of the phonograph, all the way to modern music players, record players, loudspeakers and amplifiers. “It’s a show entirely from MoMA’s collection meant to look at this two-way inspirational interface between design, technology, music and sound,” Kinchin explained. and design, and features a 1920s-era Philips loudspeaker. But the exhibit isn’t just about looking at a bunch of cool old audio gear (although for the audio nerd, it’s actually wicked cool), it’s about how the design of these products has fit in to film, architecture, etc., and how music has played a role in art. “It’s about how we connect sensations of sound and vision, and actually how music is a new material art form and is very grounded in the physical and technological world,” Kinchin said. Among some of the highlights in the exhibit are a series of short animation films coupled with music composed for the videos; a Philips loudspeaker from the 1920s; a 1957 Fender Stratocaster with a Fender Basement amplifier; and a 1963 Scopitone music and video player, which the museum plays films on once a week to give viewers the full experience. Since this new exhibit is as much about the experience of hearing recordings as seeing them, MoMA’s Audio Visual Design Manager Aaron Harrow played a big part in setting up the exhibit, using a few Soundtube loudspeakers and transducers to bring the exhibit to life. In the center of the one room exhibit is a self-contained box structure that showcases some of the smaller audio pieces, protected by a glass window. 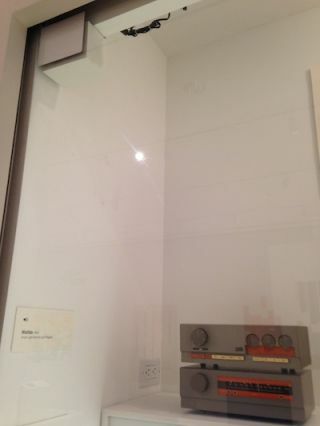 To give viewers that full experience, Harrow placed a Soundtube SD1 transducer to the corner of the glass (one on each side of the box structure), turning the glass into the speaker that plays recordings of the various items in use. “It’s about the size of a small soup can and is mounted directly to the glass,” Harrow explained. the other areas of the exhibit. Another part of the exhibit highlights the music of some later artists, from the 1950s on. To help immerse viewers into the work of these musicians, Soundtube came into play once again, this time with arrangements of FP6030-II speakers hung from the ceiling, which direct the sound to the people standing directly underneath. audio players, including boom boxes, record players and even iPods to show how the listening experience has changed over time. The purpose of the exhibit, as Kinchin explained, is to use the audio, video and lighting in the exhibit to demonstrate this relationship between music and sound, and to show how the two have evolved together over time. “The experience of connecting our sense of vision and touch with the design of these artifacts has dramatically changed,” Kinchin said. “There’s been such amazing changes in where we listen to music, the kind of spaces we listen to music in, and the kind of music made possible by new technologies, and we wanted to really animate that in this space.”For more information on the MoMA’s ‘Making Music Modern: Design for Ear and Eye’ exhibit, visit http://www.moma.org/visit/calendar/exhibitions/1523.